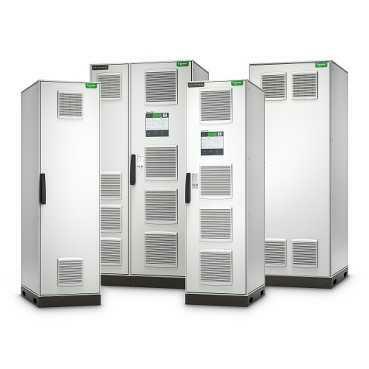 The Schneider Electric Gutor PXC 3-Phase UPS by Schneider Electric is the first pre-engineered industrial UPS for light and heavy industrial environments. The Gutor brings you the benefits of a data center level UPS combined with the ruggedness of an industrial UPS, all in a compact footprint. The Schneider Electric Gutor PXC 10-100 kVA, 208V input UPS is ideal for light and heavy industrial applications and small to medium data centers. With many standardized, pre-engineered configurations, the Gutor PXC, simplifies configuration allowing for shorter lead times and more plug and play. Gutor PXC operates in wider temperature ranges with higher tolerances for tough environments such as dust and vibration. Gutor PXC works effortlessly with your facility monitoring systems and offers full industrial design options. With a wide temperature range, from -10 to +55 °C and smaller footprint, the Gutor can fit in almost any white or gray space. It also features top and bottom cable entry and a fully integrated isolation transformer option. With full front service access, modular fans, and power modules, the Gutor PXC is one of the easiest UPSs in its class to deploy, install and maintain. The Gutor PXC is the next generation of UPS technology and can replace Silcon, Comet, and Galaxy PW UPS at their End-of-Life. Standardized engineering without compromise on performance to save on overall engineering solution cost and to deliver as a “plug-n-play” unit.